Lom had worked as a painter and commercial artist prior to leaving Germany in 1933 and continued this dual career in England. In summer 1940 he was one of many German-speaking refugees, reclassified as enemy aliens and interned at Huyton, a recently completed housing estate outside Liverpool, which also temporarily housed artists including Martin Bloch, which he described as as a place where ‘[…] every corner of the camp is a potential picture’. Within a year of his release an autobiographical account of his internment was published by Macmillan in 1941, 'Never Mind, Mr Lom,' ‘with a cover design of a figure silhouetted against coils of barbed wire. Little is known of Lom’s career post-internment, though the onset of Parkinson’s curtailed his artistic activities. He received particular support from Cyril J. Ross, Ben Uri’s treasurer, who provided studio space and employment within his furrier business, Swears & Wells, and bequeathed a number of artworks to Ben Uri following Lom’s death in 1954. 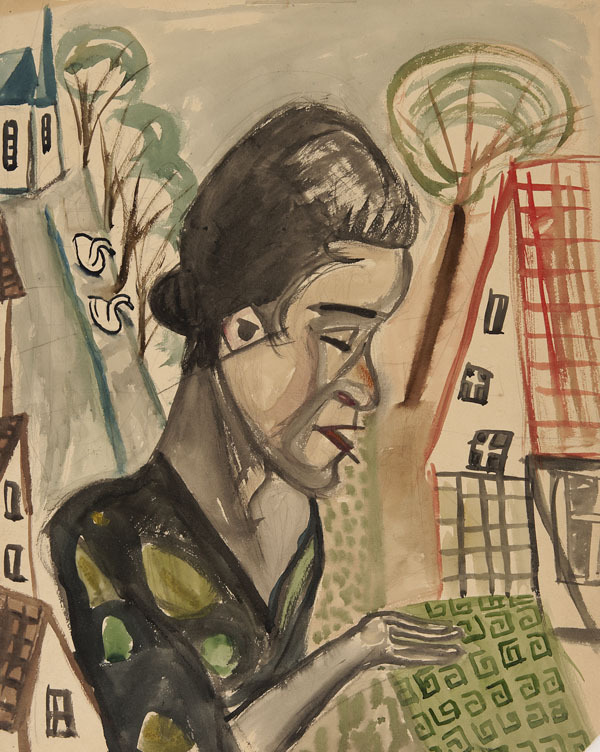 Ben Uri held a retrospective in 1954, but Lom’s reputation remained largely ignored until the 1980s when the dealer John Denham featured his work in both a solo and a group show. Number 10 in a portfolio of 24 loose works.